Our LaserGrade Agate Jewelry is handcrafted using slices of agate stone meticulously polished on both sides to enhance the color and shape that Mother Nature has imprinted. These slices vary in thickness from one sixteenth to one eight of an inch. Each piece is different due to the difference in shape of the stone used on its confection. 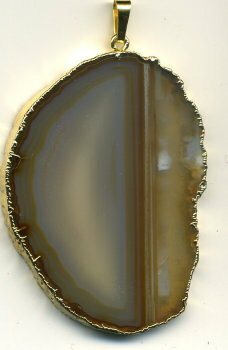 Each agate slice is rimmed with either 14K Gold or Sterling Silver to protect the edges. All Pendants come with a leather cord necklace, lobster clew clasp and a three inch extension chain. Order 1 only of each listing. You get exact one. One only! More than one ordered with get similar but not exact item. Purple Agate Pendant, rimmed in Silver 2 3/8" x 1 7/16", w/leather cord necklace. Green Agate Pendant, rimmed in Silver, 2" 1/2 x 1-3/8", w/leather cord necklace. 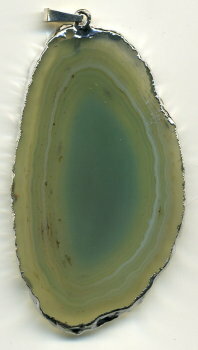 Natural Agate Pendant, rimmed in Silver, 2-1/14" x 1-1/2", w/leather cord necklace. Pink Agate Pendant, rimmed in Gold, 2-3/8" x 1-1/2", w/leather cord necklace. Blue Agate Pendant, rimmed in Silver, 2-1/4" x 1-3/8", w/leather cord necklace. Green Agate Pendant, rimmed in Silver, 2-1/8" x 1-3/8", w/leather cord necklace. Brown Agate Pendant, rimmed in Gold, 1-3/4" x 1-1/2", w/leather cord necklace. Brown Agate Pendant, rimmed in Gold, 2" x 1-3/4", w/leather cord necklace. Light Brown Agate Pendant, rimmed in Silver, 2-3/8" x 1-1/4", w/leather cord necklace. Cream and Brown Agate Pendant, rimmed in Gold, 2-1/8" x 1-1/2", w/leather cord necklace.